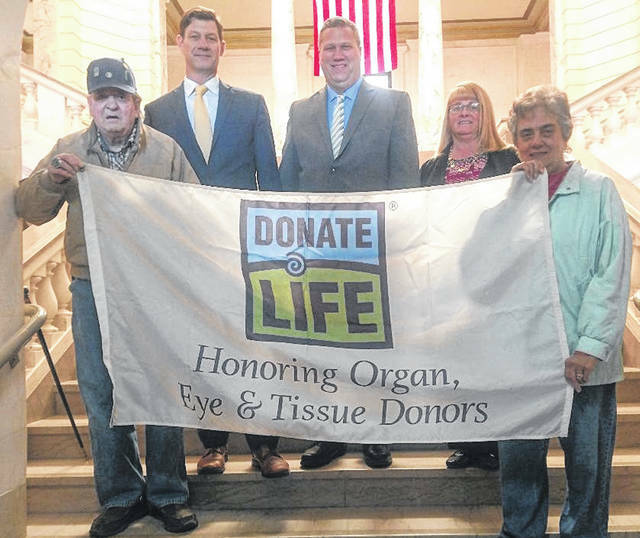 County commissioners proclaim April as “Donate Life Month” on the courthouse stairs Monday. Holding the banner are Frank and Barb Jones. The Joneses are grandparents of organ donor Luke LaPine, who died in June 2014. From left in the back are Commissioners Kerry Steed, Mike McCarty and Brenda Woods. WILMINGTON — On Monday no one from the public attended a second public hearing regarding a possible Clinton County sales tax increase, and the commissioners office has received only one email in opposition after last week’s article about the tax. No more public hearings are scheduled on the matter, but commissioners anticipate further discussion, at least among themselves, in the coming weeks. Clinton County Commissioners President Brenda K. Woods said Monday she is still continuing to do some homework on the issue and will think about it more before she is ready to make a decision. The other two commissioners said they didn’t have anything to add Monday to what they said at the first public hearing March 27. On March 27 Clinton County Commissioner Mike McCarty said that a consistent message from the public has been to not use proceeds from the sale of Clinton Memorial Hospital to pay for day-to-day expenses. In 2016, county commissioners did not renew a 0.5 percent local sales tax and since then have relied on carryover dollars to annually balance revenue with expenses. The county’s carryover has been spent down during the past three annual budget appropriations. For those three budgets there were revenue shortfalls, respectively, of about $1.9 million, $1.5 million, and $1.9 million. During the last full calendar year of the additional 0.5 percent local sales tax, it generated about $2.8 million. Currently, the local sales tax rate is 1 percent. If commissioners approve re-instating an additional local sales tax, it does not have to be at the previous additional rate of 0.5 percent. It can also be a 0.25 percent increase.